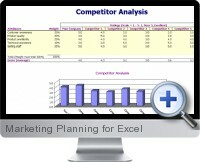 Marketing Planning templates for Excel (Office Ready) are Excel templates that will allow you to formulate both the written marketing plan and the numbers that underlie it. This solution provides professional, distinct templates for Microsoft Excel as well as Word and PowerPoint. Sales Forecast: Show projected sales and consolidate the variety of methods used to forecast. Budgets: Budget all your marketing expenses, both production and operational. Advertising: Make sure your ads are effective with worksheets to analyze profitability and market share. Competitive Analysis: Be the one to keep score and know your strengths. Decide whether possible markets are penetrable or not worth the effort. Sales Analysis: Compare forecasts to actual and effectiveness of sales force. Profit Measures: Estimate your contribution margin based on sales and costs. Pricing: Determine prices based on mark-up rate or return on investment. The Word marketing plan template contains a Document Adviser that will guide you through the process of documenting marketing plan strategy and details. This includes defining market, outlining product line and prices, identifying competitors and competitive products, characterizing customers, specifying brand strategy, explaining promotional opportunities and projecting sales. The PowerPoint template can be used for presentations. In addition to the templates, Office Ready Marketing Planning templates provide sample plans that are valuable references to you as you create your own. Document Adviser guides you through the creation of the marketing plan, section by section. Publish your marketing plans to PDF format with the program's built-in PDF publisher. Ideal for distributing the plan electronically. Included Photo Editor allows you to import images into the marketing plan for visual impact. The Marketing Planning templates for Excel user interface makes it simple to find plan resources including the plan document templates, the Excel workbook, the PowerPoint template and the sample plans. Microsoft Office compatibility. Work in a familiar environment and leverage Office's powerful tool set.